Installing and maintaining door assemblies and their components requires the individuals performing this work to be aware of the codes that affect the doors. Fire-rated door assemblies are specially engineered systems that require an increased level of attention during installation and maintenance. Knowing what type of work is, or is not, permitted to be done to certain types of door frames and doors is critical to maintaining valid fire ratings. Monitoring doors for proper operation and function, regardless of fire rating, is necessary for safety as well as ongoing code compliance. Door Safety Technicians (DST) are trained to properly install and maintain egress and fire door assemblies throughout the lifetime of their installation. DSTs have completed more than 40 hours of training specific to Swinging Doors with Builders Hardware, which include online courses. Learning door assembly components (e.g., door frames, doors, and hardware components) and their applications. Mechanical functions of swinging doors. Electrified hardware functions of swinging doors. Code requirements for doors with special locking arrangements. Door usage types and categories. NFPA 80, NFPA 101, and NFPA 105 code requirements for door safety inspections. Repairing fire-rated doors and door assembly components. Implementing a door maintenance program. Using software apps to monitor, repair, and track performance of door assemblies. 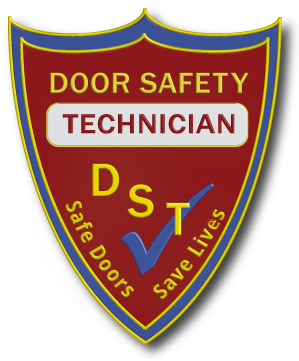 DST candidates must be regularly engaged in the installation and/or maintenance of door assemblies. Candidates can be in-house employees of a facility or employed by third-party service companies. DST candidates must achieve a minimum score of 80 percent on the online certification exam to earn the DST certification. DSTs receive a wallet card and certificate as proof of their certification. DST certification is valid for one year. DSTs are required to renew their certification annually through continuing education.